The Super 8 Las Vegas North Strip/Fremont Street Area is the new jewel of Las Vegas Blvd, offering spacious rooms and personalized customer service. 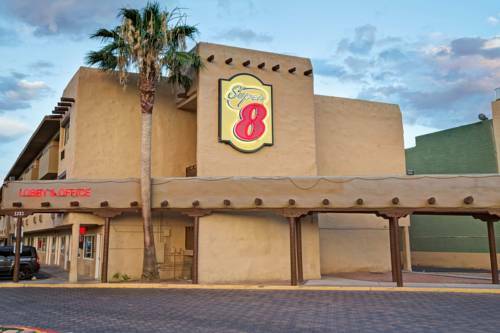 We are the best choice for clean, convenient and affordable lodging right on Las Vegas Blvd. We are located on the famous Las Vegas Blvd between the Las Vegas Strip and the newly redesigned downtown area and offer fresh coffee in the lobby 24 hours, coffee maker in all rooms, 24 hour front desk, convenience store, Cable TV with ESPN-ESPN2-MTV-CNN, ATM in the lobby and balcony in some rooms. We also offer business services, elevator, free parking, ice machine, interior corridors, free local calls, vending machines, wake up service, as well as wheelchair access and safe deposit boxes upon request. Please note that photo ID, credit card and refundable cash deposit are required to check-in. Hotel has onsite restaurant that offers a breakfast for a fee. Pet friendly.